Our object this week is a photograph from our company archives. Our photographic collection is large, and for a few weeks I want to feature it in this space because it is so fascinating. This is what we called the “Round Table.” Five women in skirts and blouses—yes ladies in 1956 if you worked back in the APH factory you had to wear a skirt. We have pictures of women in pants but they are rare. One of the women is wearing a very practical flowered apron, but another has on high heels(!) Anyhow, they stand around the table, which is about thirteen feet in diameter. Stacks of pages from the braille edition of the Reader’s Digest are arranged around the table. (APH started embossing Reader’s Digest in braille in 1928.) As it rotated—the table worked like a large phonograph—the workers picked up a page from each stack as it passed them. Every publication from APH was collated in that manner. 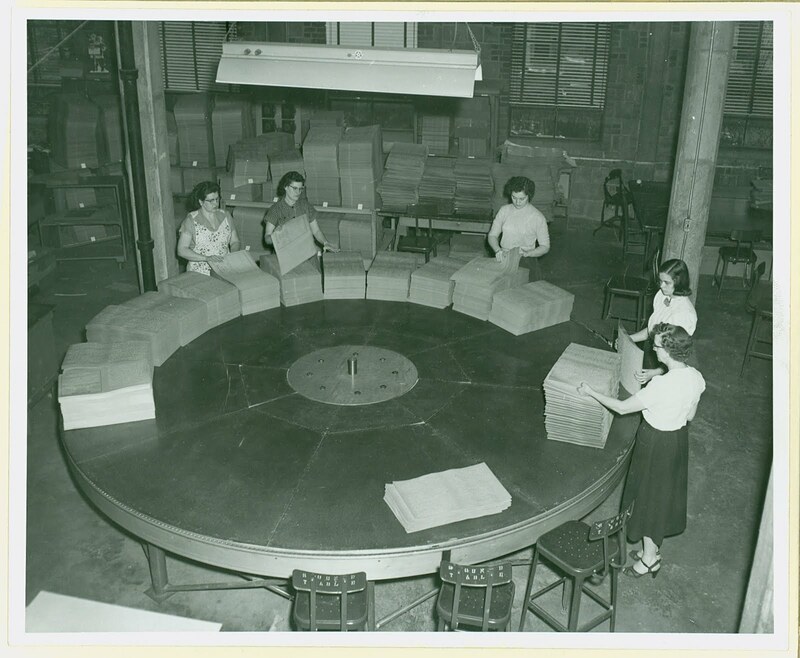 There are tall metal stools in the foreground stenciled “Round Table,” but on this day none of the women are using them. In the background, the square brick walls with their brick lined windows let you know that the scene is the 1947 Manufacturing Annex, on the ground floor. These walls are all gone now, removed when the company expanded in the 1960s. Incidentally, APH tried to mechanize the collation process many times with little success. It is hard to design a machine to handle delicate braille dots with the same care as the human hand. Although we have machine collators that use vacuum suction and mechanical fingers on the floor, you often still see human workers handling the collation on smaller jobs. Digital presses which collate publications as they emboss them also play a huge role.